Can I Choose Another Gas Supplier? Yes. Peoples and North Shore Gas customers are allowed to choose another company (also known as an “alternative retail gas supplier,” or “ARGS”) to supply them with natural gas. This program is called “Choices For You.” Alternative suppliers sell their offers in a number of ways: door-to-door, over the phone and through the mail—but also at community events and through friends. We’ve even received reports of suppliers working through churches. WARNING: Right now, the regulated utility—Peoples Gas or North Shore Gas—is still probably your best choice. Your gas bill is divided into three main sections: delivery, supply and taxes. The “delivery” section is where the utility makes a profit, and covers the costs of maintaining the pipes, reading the meter, mailing the bills, and all the other duties relating to administration and infrastructure. You will always pay the regulated utility, Peoples or North Shore Gas, for delivery; this is how the company makes its money. Also, if there is a gas leak or any other problem with your gas service, you will still call Peoples or North Shore Gas. The “supply” section of the bill covers the cost of the actual gas you use. This is the part of your bill that changes if you opt for a different supplier. Traditionally, Peoples or North Shore buys gas on the market and uses the pipelines to deliver that gas to your home. The utility is supposed to sell the gas at the same price it pays, with no markup. Choosing another supplier means that you will pay a different company to buy and supply that gas. Although those charges will still appear on your Peoples or North Shore Gas bill, they are actually being set by that other supplier—and unlike the utility, that supplier’s rates are not regulated or reviewed by the Illinois Commerce Commission (ICC). What Consumer Protections Do I Have? • You do not have to pay a cancellation penalty if you cancel a contract within 10 days of the supplier’s charges first appearing on your gas bill. • After that, no cancellation penalty can be higher than $50. • You must give consent, through a signature and a third-party verification process, before being signed up for a door-to-door offer. Will I Save Money With Another Supplier? There’s no guarantee you’ll save money. Since 2003, CUB has been monitoring alternative supplier offers, and the consumer group has found that about 9 of 10 offers marketed by suppliers have been money-losers. Remember, Choices For You is optional. If you don’t sign up, you will continue to be served by Peoples Gas, or North Shore Gas with rates regulated by the ICC. If you find gas choice too confusing or too risky, you’re not alone, and can opt to remain with the utility. 1) Be careful about people at your door who say they’re from the “gas company” and offer to lower your bill. 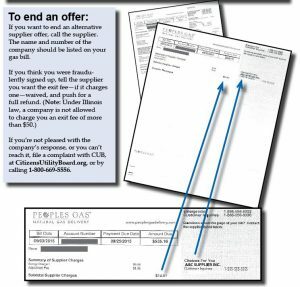 Don’t give out your account number or gas bill unless you’re sure you want to sign up for an offer. A dishonest sales rep can use your account number to sign you up for an alternative supplier without permission. 2) Find out what the company is charging and how that compares with the utility’s price, below. Ask whether the supplier rate is a fixed rate, and for how long, or a variable rate that changes monthly. 3) Ask if the rate is an introductory rate, how long it lasts, and what the new rate will be. People complain to CUB that the low price they signed up for disappeared after a few months and their bill skyrocketed. 4) Ask if the plan charges any fees. CUB has seen monthly fees as high as $9 a month. That’s about $100 in costs over a year, before you even use any gas. Also ask if the company charges an exit fee if you want to leave a plan before the contract is up. 5) If you don’t want suppliers to bother you, get on your utility’s do-not-market list. For Peoples Gas, call 1-866-556-6001. For North Shore, call 1-866-556-6004. How Do I Know If I'm With An Alternative Supplier? Click for an enlarged version. On your Peoples/ North Shore Bill: If you’re with another supplier, that info is most likely on page 2 of your Peoples/North Shore bill, under “Summary of Supplier Charges.” If the bill does not list a per-therm alternative supplier rate, you have to figure it out yourself based on the total supply amount and how many therms you used.